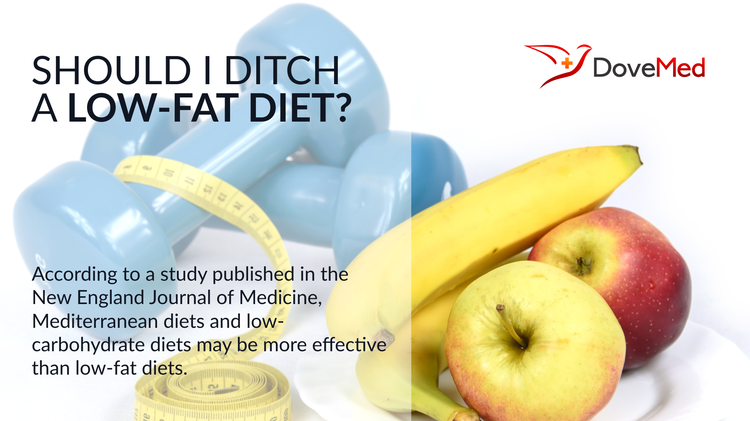 Should I Ditch A Low-Fat Diet? According to publications released by the National Institutes of Health and the USDA Center for Nutrition Policy and Promotion, Americans got 45% of their calories from fats and oils in the 1960s. A study published in the International Journal of Obesity and Related Metabolic Disorders in 1998, 13% adults were obese and less than 1% of the adults had type II diabetes. It is a myth that a low-fat diet is good for health. For many decades, low-fat diets were recommended for people who wanted to lose weight, prevent heart disease and avoid chronic conditions. Based on this myth, food companies marketed fat-free products and reduced-fat food. They corrected for the differences in texture and flavor of the foods by increasing the amounts of sugar, refined grains, or salt. But, following a nearly-zero fat diet has not proven to help people. According to publications released by the National Institutes of Health and the USDA Center for Nutrition Policy and Promotion, Americans got 45% of their calories from fats and oils in the 1960s. A study published in the International Journal of Obesity and Related Metabolic Disorders in 1998, 13% adults were obese and less than 1% of the adults had type II diabetes. Most recent statistics unveiled by the National Center for Health Statistics and Centers for Disease Control and Prevention show that Americans get 33% of their calories from fats and oils today. Despite this, 34% adults are obese and 11% have type II diabetes. These results are explained by the fact that the total quantity of fat in one’s diet is not associated with disease or weight. The kind of fat and the total number of calories making up one’s diet are the significant factors related to weight loss or gain. Trans fats or saturated fats are considered to increase one’s risk of developing certain diseases. On the other hand, polyunsaturated fats and monounsaturated fats have been found to be good for heart health. People do not take unsaturated fats that are good for the heart. People tend to eat more easily-digested carbohydrates, such as potatoes, white rice, sugary drinks, and white breads, to replace the fats. Since the body metabolizes these foods very quickly, the blood sugar level rises rapidly and causes insulin levels to rise fast. Over a period of time, eating these carbohydrates puts people at risk of developing diabetes or heart disease. Thus, they are just as bad as saturated fats. People may also eat more refined carbohydrates and sugar, instead of healthy fats. According to a study published in the New England Journal of Medicine, Mediterranean diets and low-carbohydrate diets may be more effective than low-fat diets. Another study conducted in 2013 showed that people at a high risk of cardiovascular disease, who followed a Mediterranean diet along with extra-virgin olive oil or nuts, had reduced incidences of heart disease over a duration of 4.8 years. Thus, it may be concluded that there is no “perfect” diet for each individual. The best possible diet is one that contains suitable portions of each nutrient (including fat) and is customized according to one’s activity levels and body type. Flegal KM, Carroll MD, Kuczmarski RJ, Johnson CL. Overweight and obesity in the United States: prevalence and trends, 1960-1994. Int J Obes Relat Metab Disord. 1998 Jan;22(1):39-47. PubMed PMID: 9481598. Katan, M. B., Grundy, S. M., & Willett, W. C. (1997). Should a low-fat, high-carbohydrate diet be recommended for everyone? Beyond low-fat diets. The New England journal of medicine, 337(8), 563. Lissner, L., & Heitmann, B. L. (1995). Dietary fat and obesity: evidence from epidemiology. European journal of clinical nutrition, 49(2), 79-90. Shapin, S. (2007). Expertise, common sense, and the Atkins diet. Snyderman, N. L. (2010). Diet Myths that Keep Us Fat: And the 101 Truths that Will Save Your Waistline--and Maybe Even Your Life. Harmony. Venuto, T. (2004). 10 Lies About The Atkins Diet.